Thomas Bush was appointed to be Assistant Director of the Criminal Justice Information Services (CJIS) Division of the Federal Bureau of Investigation (FBI) on December 23, 2004, by Director Robert Mueller. During his tenure, he was responsible for day-to-day operations of the FBI’s largest division, with more than 2,500 employees, and an annual budget of approximately $1 billion. He directed the award of two significant IT projects, Next Generation Identification and N-DEx, and was instrumental in establishing the interoperability of FBI, DHS and DoD biometric systems. Mr. Bush began his career with the FBI in 1975, in the Identification Division (now CJIS) and the Information Resources Division. He became an FBI Agent in 1979, and began in 1980 in Bank Robbery and Fugitives. In 1988 he was promoted to Supervisory Special Agent in the Fugitive/Government Reservation Crimes Unit of the Violent Crime and Major Offender Section, Criminal Investigative Division. In 1990, he transferred to the Jackson (Miss.) Field Division as a Supervisor Special Agent, directing Violent Crime, Drug and Civil Rights investigations. In 1996 he was promoted to Assistant Special Agent in Charge in the Atlanta Field Division. 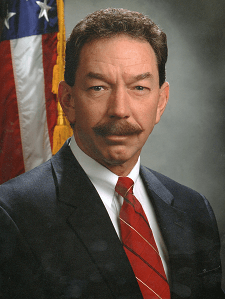 Mr. Bush was promoted to Section, Programs Development Section, CJIS Division, in 2000, and was appointed Special Agent in Charge, St. Louis Field Division, in 2002. He became a member of the Senior Executive Service in 2000. Among his professional accomplishments, he was designated by Homeland Security Secretary Tom Ridge as a Principal Federal Official in 2004; was a recipient of the Presidential Rank Award in 2007; and a recipient of the SEARCH O.J. Hawkins Award in 2010. Mr. Bush retired from the FBI in 2009 and established Tom Bush Consulting, LLC. Mr. Bush holds a Bachelor of Public Administration from the University of Mississippi. During his tenure with the FBI he graduated from the National Executive Institute and the Executive Development Program at the Kellogg School of Management.